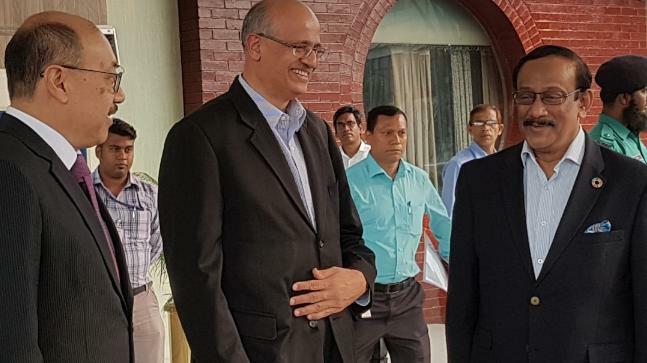 Dhaka, April 9 (BDNews24): Bangladesh is happy over India’s position on the Rohingya issue and its progress on the pending Teesta water sharing deal, Bangladesh Foreign Secretary Md.Shahidul Haque said after talks with the visiting Indian Foreign Secretary Vijay Gokhale. Haque said the two discussed all aspects of the relations between the two nations, including the pending Teesta water sharing issue, and was “delighted” regarding the outcome. “I am very happy to say that India reiterated their commitment and that they are looking into resolving this issue as soon as possible,” he said, at a joint statement after the meeting at state guesthouse Padma on Monday. The Indian foreign secretary praised the nations’ progress in bilateral relations and said: “We assure you we are working hard internally to resolve the issue”. He said Delhi is “aware” of the few outstanding issues in the relations. Six MoUs related to education, culture, road infrastructure, and communication, have also been signed. The agreements include the implementation MoU on the friendship pipeline between Numaligarh and Parbatipur, a MoU on cooperation between Prasar Bharati and Bangladesh Betar, an MoU for setting up an ICCR Urdu Chair in Dhaka University and an Addendum to the GCNEP-BAEC Interagency Agreement. The two sides also signed two more MoUs for grant projects under which India will set up language labs at 509 schools in Bangladesh and upgrade different roads in Rangpur city. “This is part of our endeavour to undertake projects in Bangladesh in various socio-economic sectors, including education, culture, health, community welfare, road infrastructure etc, for which we are providing 1,600 crore taka [Tk 16 billion] under grant financing,” the Indian foreign secretary said. He said India remains a “committed development partner” of Bangladesh and has extended lines of credit of over $8 billion to Bangladesh in the last seven years. This is the largest amount of credit India has ever committed to any single country, he said. “We are confident that this credit will be useful to Bangladesh as it pursues its developmental priorities,” he said, citing Prime Minister Narendra Modi’s comments that Bangladesh and India are not just “pass pass” (close to each other) but also “saath saath” (together). “We have made tangible progress on almost every item on the agenda set by the two prime ministers during the state visit of the prime minister of Bangladesh to India in April 2017 and that of the prime minister of India to Dhaka in June 2015,” the Indian foreign secretary said. “We have been able to explore new and high-technology areas for joint cooperation and, at the same time, been able to reinvigorate and restore our old connectivity links,” he said. Gokhale also announced the second phase of humanitarian assistance for the Rohingya refugee camps in Cox’s Bazar. This support will be help support field hospitals specially focused on women and child care with all necessary medical equipment and support systems, he said. India also plans to send relief supplies including milk powder, baby food, dried fish, cooking stoves and cooking fuel, raincoats and gumboots. “This is based on the requirements projected by the government of Bangladesh, especially to cater for the difficult rainy season to come,” he said, adding that Bangladesh’s humanitarian gesture in supporting displaced persons from the Rakhine state of Myanmar is “admirable”. “India has been fully supportive of the efforts being made to resolve the crisis, including early repatriation of the displaced people,” he said. India had previously sent relief materials for 300,000 people in September of last year under ‘Operation Insaniyat’ to support the Bangladesh government in its humanitarian efforts. India is also providing socio-economic support under the Rakhine State Development Programme on the Myanmar side of the border, including construction of pre-fabricated housing in order to meet the needs of the returning people. The Bangladesh foreign secretary said the discussion was “very long, open and frank” on all aspects of Bangladesh-India relations. “We are very happy the way our friend from India is looking at this [Rohingya] issue, looking to peacefully resolve the issue,” he said, adding that the Bangladesh-India relationship was unlike that of any other countries. “It’s organic, it’s very integrated, it’s very dense,” he said, adding that both countries collaborate not on national, but also international matters. The Indian foreign secretary arrived in Dhaka on Sunday, his first visit after assuming the office on Jan 29. Before the bilateral meeting he called on Foreign Minister AH Mahmood Ali. He will also meet Prime Minister Sheikh Hasina on Monday evening. He is scheduled to leave on Tuesday morning.